The high-efficiency HEPA replacement filter (for Broan HEPA 3100 and HRV2600 units) ranks among the best on the market. Indeed, it captures 99.97% of dust and particles as small as 0.3 micron (1 human hair = 150 microns). It can help reduce allergy and asthma symptoms, recurring colds and persistent coughs. In fact, HEPA filters are so effective that they are used in hospital operating rooms. HEPA Replacement filters fit Venmar HEPA 1000, 2000, 3000, 3100, 4000 and 4100 and HRV 2500 and 2600 whole-house ventilation systems. Includes one HEPA and 2 prefilters. 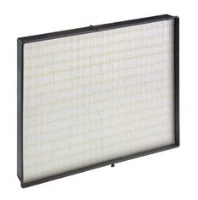 Replace the HEPA once a year and the prefilter every 6 months.